It’s unusual for an interceptor in that the tuning software for the product is freely available and that with the research and development done by the people who sell it, excellent technical support is available. In base form the XEDE costs $AUD990 and is available to anyone – you don’t have to be a dealer or sign any licensing arrangement. a map changeover switch that allows the selection of two different tuning maps (AUD$25). The XEDE is available with two high current outputs to allow it to drive an extra injector, boost control solenoid, etc. 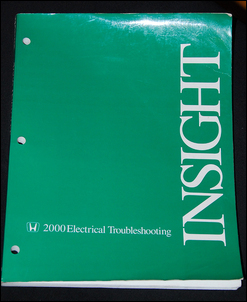 At the time of purchase you should specify that you require a high current output. This addition costs AUD$105. The XEDE is normally pre-configured to suit your car’s specific sensors and has a base tuning map loaded. The latter is for modified cars – the map attempts to take the specific modifications into account and represents a starting point for further tuning. The XEDE is laptop programmable. Unless you are using a very old laptop that has a serial port, to connect to the XEDE you will need a serial to USB converter, and possibly an extension cable. Also note that if you intend tuning on the road, you’ll probably need a 12V-to-mains power inverter to allow you to run the laptop for long periods without having to rely on its internal battery. These days, with the proliferation of factory ECU tuning software, interceptors have a faintly old-fashioned air. Rather than changing the internal software, interceptors alter the signals that the ECU sees – and in response, the ECU changes in its output behaviour. For example, if you intercept the airflow meter signal and reduce the amount of airflow the ECU ‘thinks’ is passing into the engine (eg by reducing the airflow meter voltage level) then the air/fuel ratio will become leaner. By altering the timing pulses that the ECU sees coming from the crank-angle sensor, the ignition timing can be advanced or retarded. These changes can be mapped at individual sites of load/rpm or throttle position/rpm - or other combinations as required. However, interceptors have major limitations, especially when the engine’s mechanical modifications are large. One problem is that changing a single input variable (say sensed engine load) may cause the ECU to alter more than one of its outputs. For example, as well as making the mixtures leaner, with a reduced load signal the ECU will probably advance the timing (lighter loads require more timing advance). That’s fine if you are leaning-out mid-range mixtures (where you’d normally advance the timing anyway) but not so good if you are leaning out full load mixtures (where you would not normally advance timing!). Also, changing the timing of the crank-angle sensor may not only alter ignition timing, it may also (in cars with variable cam timing) also change cam timing! With an interceptor you cannot alter rev limiters, adjust commanded idle speed, alter knock sensor sensitivity or easily change electronic throttle control. Finally, it is not usually possible to alter air/fuel ratios when the system is operating in closed-loop - that is, the input of the oxygen sensor is being used by the ECU, usually (but not always) to keep the mixtures around 14.7:1. So with all these apparent disadvantages, why use an interceptor? In short, when the factory engine management software is not ‘cracked’, using an interceptor is an easy and effective approach. For example, in the car to which we’ll be fitting the XEDE, a Honda Insight, there is no tuning software available for the factory engine management system. 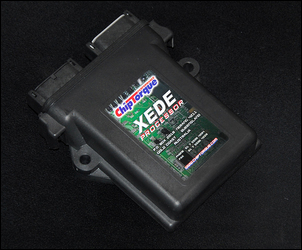 Replacing the Honda ECU with an aftermarket programmable ECU would immediately cause problems running the digital dash; easiest in this case is to use a sophisticated interceptor like the XEDE. 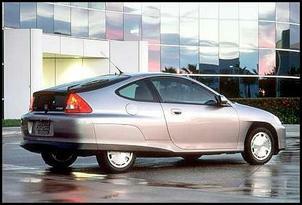 The Honda to which the XEDE is being fitted is a 2000-model hybrid petrol/electric car. In this particular car, the high voltage battery has died. It’s no longer worthwhile replacing this battery – but, unusually for a hybrid, the Honda can still function without the hybrid system working. However, in this condition the Check Engine and IMA (Integrated Motor Assist) dash warnings are illuminated and the rev limit drops by about 1000 rpm. Without the electric assist, low-rpm torque is markedly reduced and power is reduced throughout the rev range. The plan is to remove the oxy sensor feedback loop and then use the XEDE to tune the air/fuel ratios and ignition timing through the whole load and rev range, aiming to achieve optimal performance and fuel economy without the hybrid system working. 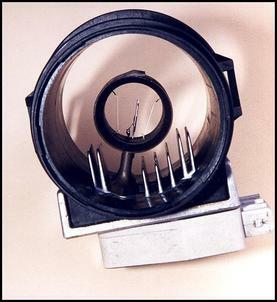 As stated in the main text, interceptors are usually used in applications where the modifications are relatively small. However, if they are well set-up, excellent results are possible even on high power cars. 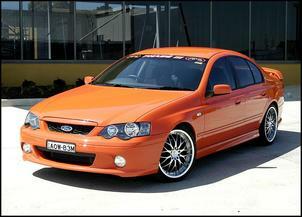 The pictured Falcon, that we drove back in 2003, used a UniChip interceptor. These days, with tuning software widely available for the Falcon ECU, you would not use an interceptor in this type of application. But the interesting thing is that the very fast Falcon drove extremely well, with no signs of detonation and excellent linearity and response. To state it again: no, we would not recommend any interceptor being used when the factory ECU can be directly tuned. But the Falcon remains an interesting example of what can be achieved when you want to take the intercepting path. For more on that car, see APS Phase 3 Teaser. 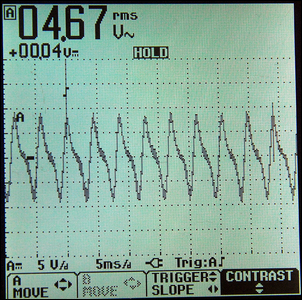 In the case of the 3-cylinder Honda Insight, I used a Fluke Scopemeter to capture the waveform from the crank-angle sensor and two camshaft position sensors, directly photographing the scope screens and sending the pics to ChipTorque. Chief electronics engineer Rhys Drummond (the developer of the XEDE) then configured the XEDE to suit. 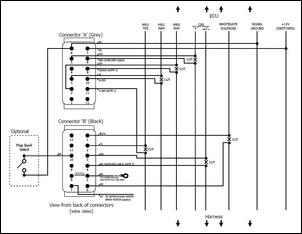 Before you can fit the XEDE (or any other interceptor) you must have access to a good wiring diagram showing the inputs and outputs of your car’s ECU. At minimum these need to include the load sensor input (airflow meter or MAP sensor), crank-angle and throttle position sensors. If you wish to control turbo boost, you’ll also need access to the wastegate wiring. The XEDE is provided with a simple wiring diagram (if buying an XEDE, check for latest versions of this diagram). In addition to the above connections, you’ll also need switched 12V and sensor ground – both able to picked-up directly from the ECU. 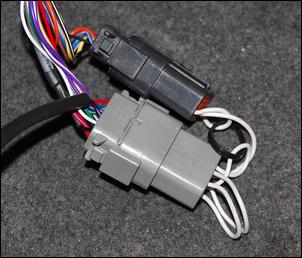 If you have purchased the optional bypass plug, after wiring the XEDE harness into place you should be able to connect the bypass plug and then start the car – it should run as it did before your wiring additions. If the car runs differently, check your wiring! With the XEDE wired into the car and the car able to run properly (or at least run as you would expect at this stage), connect the laptop. If using a USB-to-serial adaptor, load the software provided with the adaptor. Plug the cable into the XEDE harness, open the XEDE tuning software (called XMap) and then turn on the ignition. A ‘connected’ or ‘not connected’ line will show at the base of the XEDE XMap software window. If the laptop is not connected to the XEDE, try different Comm Ports as available through the XMap Set-Up menu. For tuning I initially used a small netbook that does not have a disc drive. I transferred both the USB adaptor and XMap software to the netbook using another PC to first place the software on a USB memory stick and then copying it to the netbooks’s hard drive. While the netbook initially worked fine I subsequently found that lots of communication errors were occurring – indicated by a warning to that effect popping up on the screen. I tried a different USB-serial converter but the problem remained. It was only by changing to a different laptop was I able to fix the problem. To do any tuning you will need to have a wideband air/fuel ratio meter monitoring exhaust gas. These days, such digital meters are cheaper than ever before and are usually quite accurate in the range that people most commonly tune engines (say, 12:1 – 16:1). 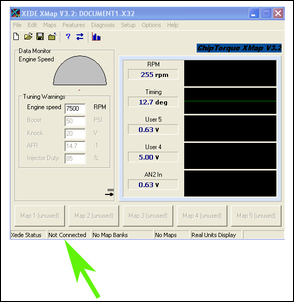 With the air/fuel ratio meter working, and the car idling, open the XMap fuel map and alter a value. You know where the engine is operating on this map by the coloured yellow boxes (these move as you blip the throttle); simply insert higher values into these boxes. You should then see on the meter the air/fuel ratio change in response. If the car is in closed loop, this change will be rapidly ‘learned around’ by the ECU. Alter the values up and down at the current load site and confirm that you can change mixtures (even if only for short time) in both directions. Next alter the current value of ignition timing – ignition timing is on another map. When changing timing you should hear the engine’s idle speed alter – eg a small advance will normally increase idle speed. Again, this change may be quickly learned around by the ECU returning engine idle speed back to standard. Also check that the engine speed readout on the XMap software matches the actual engine speed. In the case of the Honda, as these checks were being done it was realised that the displayed XMap engine speed was twice that of the actual engine speed. Contact was made with ChipTorque and a new configuration file was emailed that fixed this – this is the first XEDE ever fitted to a Honda Insight and the wrong file was initially provided. Note that ensuring the XMap and engine rpm match is quite important; the amount of timing change that actually occurs with adjustments depends on this figure being correct. With everything wired into place and working, now you’re ready to start tuning. The XEDE Processor was made available for this series at no charge. Two optional high current outputs for boost control, water spray or auxiliary injector, etc.